Our poultry tractors used to sit dormant in between bird batches, now they are used year round, in a variety of ways. 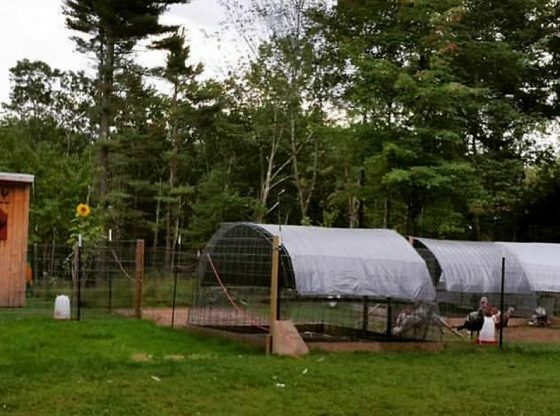 Our multi-purpose chicken tractors now serve us in every season and have become an essential tool on our homestead. From meat-bird tractor, to quarantine units, to flock-introduction structures, to winter greenhouses (in New England, which isn’t easy! ), to calf hutches, we keep coming up with new ways to utilize them. Years ago, when we built our first portable meat-chicken tractor, I laughed when Larry popped our puppy, and his toy, inside to keep him out of the way while we worked on a second tractor. “It’s like a playpen,” he said. Two years later, those words came back to me, when we used it to quarantine two newly-acquired Nigerian Dwarf goats, before introducing them to the rest of the herd. They didn’t necessarily play, but they were in a safe place to observe their new surroundings. A single, portable 8 x 10 arch-tractor can be used year round, even in the worst climates. With simple adjustments, they can be adapted to your own needs and location. This size (and smaller) is manageable (with or without machine assistance) by one person. Moving a larger unit often requires two or more people, or the assistance of machinery (tractor, 4-wheeler, etc.) for one person. At any time, any well-made unit can be turned into a permanent structure. Then back to portable units by removing the modifications. The size of your arch structure will depend on individual needs, available supplies, available space, and budget. If you plan on using them to house animals, research the required amount of space and follow the guidelines. Animal overcrowding carries a huge number of risks. Screw the boards together to make an 8 x 10 base. Once the base is built, bend both cattle guard panels into an arch. Secure with galvanized staples (hammer them) INSIDE the 8-foot boards. Frame a door with 2 x 4s on one side. Wrap the back side and the front side (around the door) with chicken wire. Secure with zip ties. Place tarp over the arched cattle panels. Secure with zip ties. 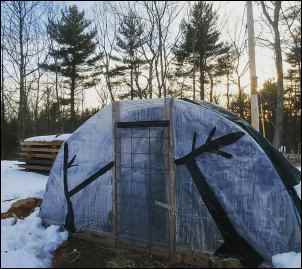 Wrap chicken wire from the base up to wherever your tarp ends. Make sure the chicken wire is under the tarp. Construct a door from extra cattle panel, wire, wood… whatever you choose. Use whatever hinges you desire. We have a long perch mounted inside every arch tractor. Birds roost on it. I also use this to move the unit when animals are inside by inching it along. When no animals are inside, we drag it with the 4-wheeler or tractor. Please note: The pressure treated units are heavier than the pine units. For a greenhouse: Cover the entire unit with 6-mil plastic sheeting. I have used 4 mil in mild winters, but it did not perform as well as the thicker plastic in severe winters. There are many ways to increase the temperature in a greenhouse in winter. Research the best techniques for you and your budget. We have successfully increased our greenhouse temperatures with natural and free methods. 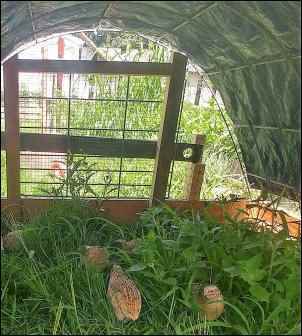 For a quarantine/introduction unit: When introducing new poultry and animals to our homestead, we quarantine them for a minimum of two weeks at least ten meters from existing flocks. Free-ranging animals do not have access to the quarantine area. 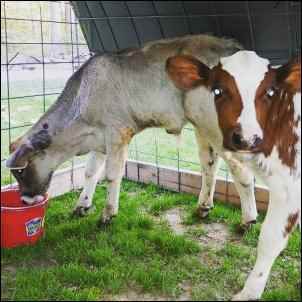 After the quarantine is lifted, animals are slowly introduced to each other. The arch tractor can be moved closer to existing coops so animals can observe each other from with the safety of mesh in between them. For a permanent structure: We have turned smaller tractors into permanent and semi-permanent units by affixing metal roof-panels and plywood walls. The arched roof aids in snow removal which is a plus. Lights, ceiling fans, etc. can also be added. The uses of arch tractors are endless, limited only by one’s imagination. How do you imagine them being used? I’m always looking for new ideas.